Last week was a crazy week. The one way that I keep things sane in my life is by sticking to a routine, it’s really the only way that things get done. But last week my finely tuned plan was thrown out the window when I had to go out of town for work. I say “have to” but heading to a breathtaking ranch in northern New Mexico to do field work is no a hardship for me. It does throw my Ironman training out of balance. No biking, no swimming and a crap foot means not much training happened early in the week. 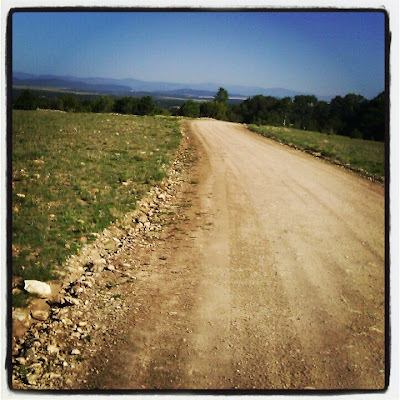 I did get a chance to run a few miles and had one magical moment running on the dirt roads of the ranch. With one standing in the middle of the road in front of me. It didn’t let me get very close before running off to be with the others. My foot may not have been great but I finished on a supper runners high. Being able to mix two things I am passionate about (wildlife conservation and running) made this the best run I have ever been on in my life. I will share more later on the rest of my week, out metric Ironman on Saturday and the progress of my foot. But for now I want to stay in my happy running place in New Mexico. 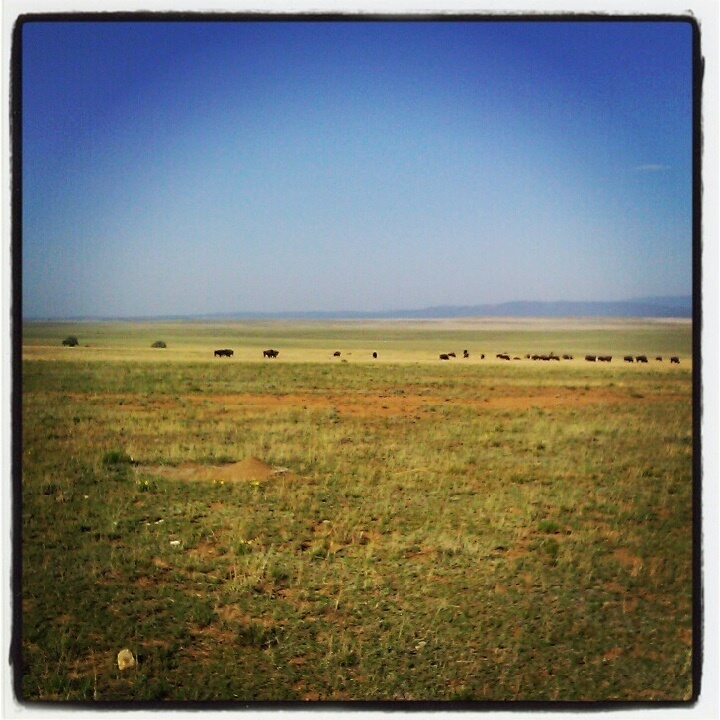 I miss New Mexico! And maybe your schedule went out the window for a little while but the bison totally makes up for it! 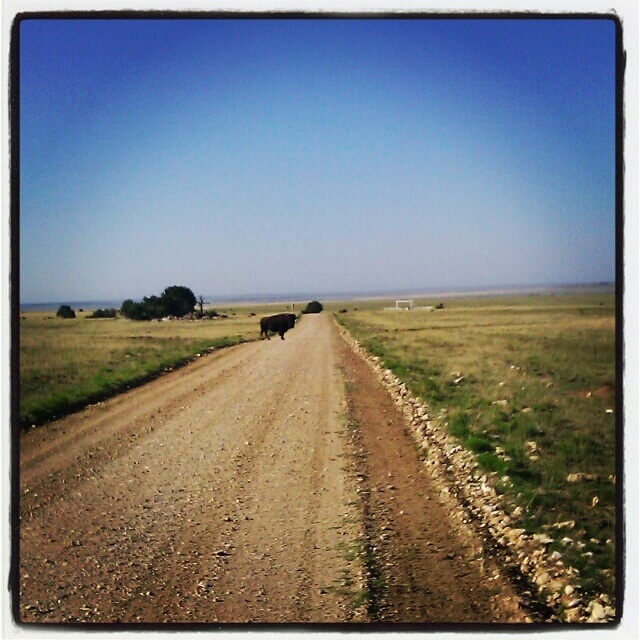 Awe running with bisons sounds magical. 🙂 Any white ones? Any wild life around is actually. Hahah, that buffalo is too cute! I see them sometimes on some road in Castle Rock. You’ll get back on track with the training, it’s not easy when you travel. Amazing pictures!!! 🙂 That’s a run you’ll never forget! Congrats on your season so far, keep up with your inspiring training! Once in a lifetime stuff! I noticed on your blog that you are a true Ironman, having worked your way up to becoming an amazing triathlete. I love that this blog is honest, raw, and real with what training for something like an Ironman entails. I am cyclist myself, so I especially have appreciated the holistic view of the training you have done, sharing with us all of the beauty of the journey. I noticed that you were planning on participating in the Cour d’Alene race, but as a premier triathalete, I was wondering if you have ever done a blog post about how important it is to taper before a race, as well as include rest and refueling as part of the training regimen. As you probably know, athletes spend months preparing for endurance events, taking great care with pre-race nutrition, but consuming the right nutrients after a workout is just as important! This year the REFUEL | “got chocolate milk?” campaign launched to educate athletes of all levels about the benefits of including chocolate milk in their post workout routine. Lowfat chocolate milk has what it takes to help athletes recover after a hard workout – the right mix of protein and carbs to refuel and rebuild exhausted muscles, plus fluids and electrolytes to replace what’s lost in sweat. Team REFUEL has paired up with the Ironman Cour d’Alene, taking place Sunday, June 24, to educate athletes on proper recovery after long workouts. Since Team REFUEL will be in Cour d’Alene for the Ironman, I would love to chat with you about the benefits that chocolate milk provides and how to join Team REFEUL. PS contact me at lmiller@webershandwick.com or give me a call at 312-988-2113. Thanks!